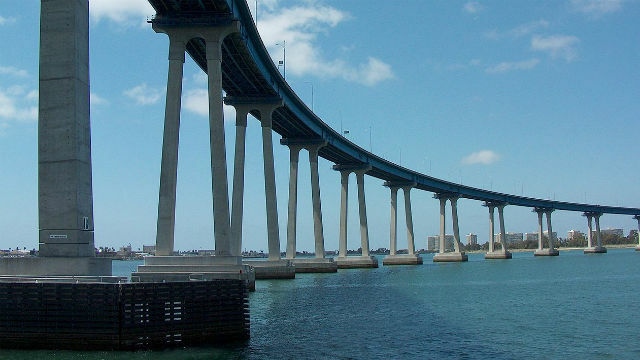 Forty-nine years ago today, the 2.1-mile San Diego-Coronado Bridge opened for traffic during what was the 200th anniversary celebration of San Diego’s founding. The bridge is an iconic landmark, as recognizable as New York City’s Empire State Building, and as it readies for it’s “five 0” bash next year, the city and state are primping it for the big day. A structural feat, the bridge required 20,000 tons of steel and 94,000 cubic yards of concrete to construct. At the time, the five-lane wonder featured the longest continuous box girder in the world. But the bridge has always been a magnet for suicides, so with one year to go before the 50th birthday party, work is underway to reduce jumping deaths. After a series of 2017 public forums, it was announced in June that Caltrans will install bird spikes on the bridge as a temporary solution to preventing suicides while the agency continues to study a permanent barrier. The spikes are similar to those used to prevent pigeons from roosting on ledges and roofs. They are being attached atop the short walls that now line the bridge. More than 400 people have plunged to their deaths since the bridge’s Aug. 3, 1969 opening. Caltrans officials hope to have the spikes installed by next summer, just in time for the half-century celebration that might also include new programmable LED lighting installed across the bridge. The lighting project is being managed through a partnership between the Port of San Diego and Caltrans, and will be paid with donations. The Port is attempting to raise $10 million by next year for the project.